or the special people in your life who love fresh fruit and sweet and savory snacks, the Succulent Fresh Fruit & Snacks Tower from The Fruit Tree™ is the perfect choice. They’re sure to delight when they bite into a selection of juicy, fresh-from-the-tree fruit including seasonal apples, pears and a juicy navel orange. We’ve also included goodies like Caramel Drizzled Frosted Pretzels, Berry & Nut Trail Mix, Peanut Brittle and more! Arrives topped with a festive hand-tied green bow. • When the fresh fruit is gone, the beautiful boxes are perfect for storage and organizing. For the special people in your life who love fresh fruit and sweet and savory snacks, the Succulent Fresh Fruit & Snacks Tower from The Fruit Tree™ is the perfect choice. They’re sure to delight when they bite into a selection of juicy, fresh-from-the-tree fruit. 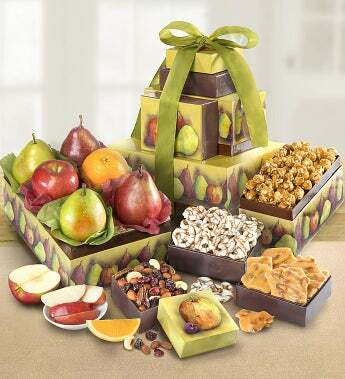 We’ve also included goodies like Caramel Drizzled Frosted Pretzels, Berry & Nut Trail Mix, Peanut Brittle and more!